Polska Prezydencja w Radzie Unii Europejskiej 2011 Polish Presidency of the Council of the European Union 2011 Présidence polonaise du Conseil de lUnion. 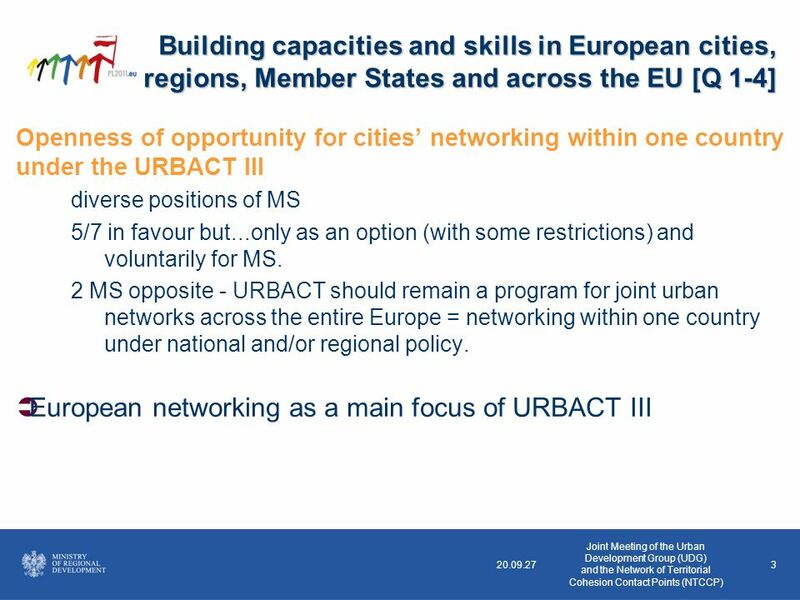 6 20.09.116 What other specific actors should be involved and encouraged to participate in URBACT projects? 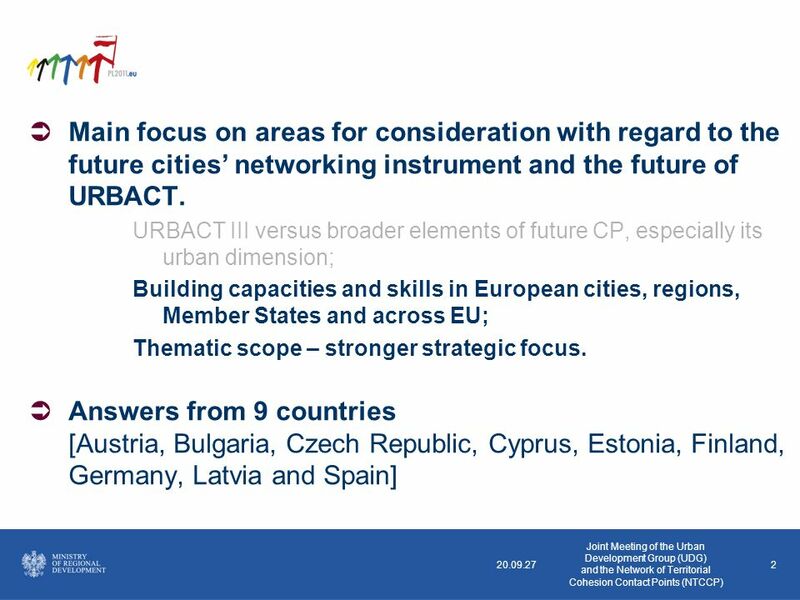 Cities as a main target group of URBACT III Broad range of necessary stakeholders [7 MS] Building capacities and skills in European cities, regions, Member States and across the EU [Q 1-4] Joint Meeting of the Urban Development Group (UDG) and the Network of Territorial Cohesion Contact Points (NTCCP) ocities associations, oactors recommended by MAs, olocal chambers of commerce and industry, ostakeholders from civil society and NGOs (e.g. 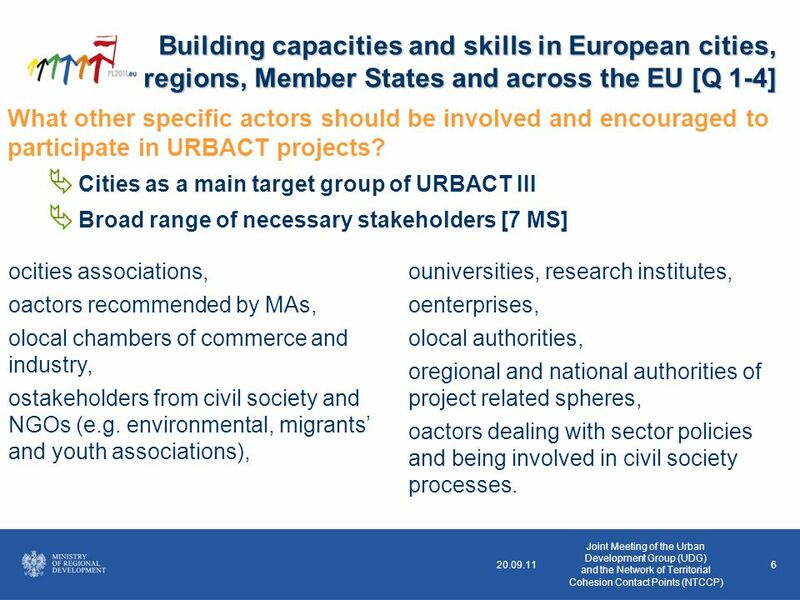 environmental, migrants and youth associations), ouniversities, research institutes, oenterprises, olocal authorities, oregional and national authorities of project related spheres, oactors dealing with sector policies and being involved in civil society processes. 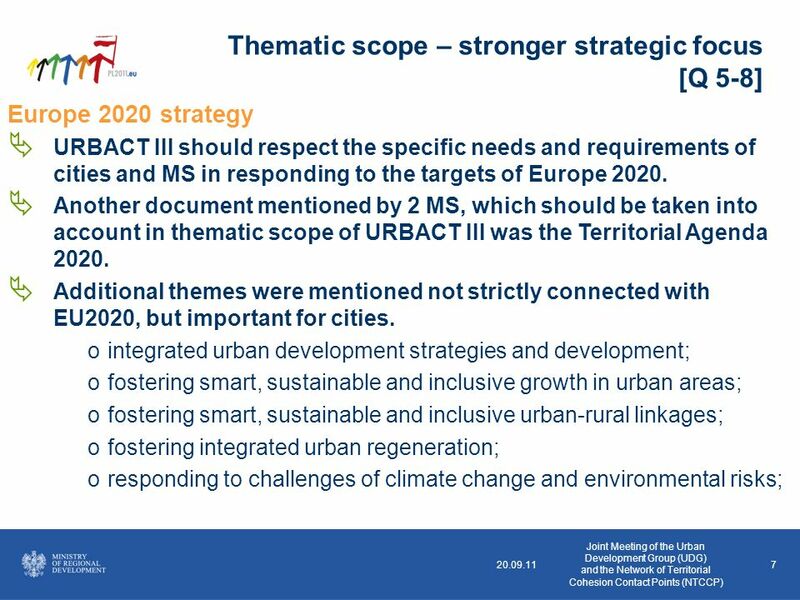 9 9 Thematic scope – stronger strategic focus [Q 5-8] Joint Meeting of the Urban Development Group (UDG) and the Network of Territorial Cohesion Contact Points (NTCCP) 20.09.27 Better relation of URBACT III with other strands of ETC To link URBACT with ESPON, INTERREG IV C and INTERACT. 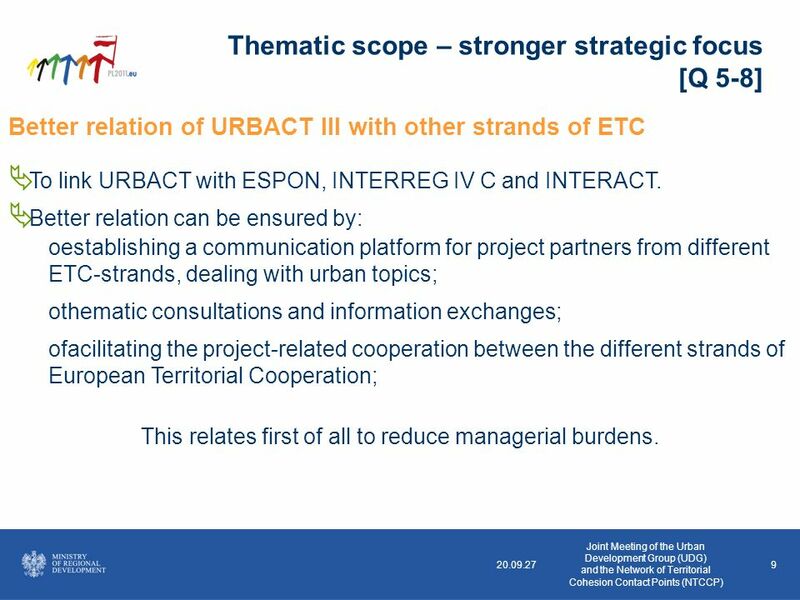 Better relation can be ensured by: oestablishing a communication platform for project partners from different ETC-strands, dealing with urban topics; othematic consultations and information exchanges; ofacilitating the project-related cooperation between the different strands of European Territorial Cooperation; This relates first of all to reduce managerial burdens. 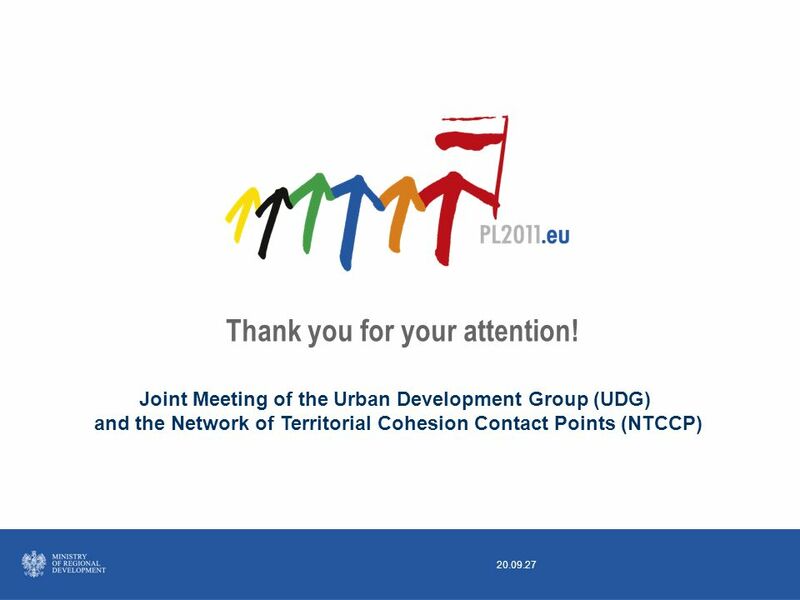 11 11 Thematic scope – stronger strategic focus [Q 5-8] Joint Meeting of the Urban Development Group (UDG) and the Network of Territorial Cohesion Contact Points (NTCCP) 20.09.27 Also the link with MAs of programmes (Objective 1 and 2) was indicated as necessary [2 MS], especially: ensuring timely and simultaneous discussion and programming process for ETC programmes and Objective 1 and 2 OPs to ensure internal coherence and complementarity as well as adequate distribution of funds, improving their awareness about what are the flagship projects in urban world, and thus relevant for funding, link with mainstream programmes is enough and should not be strengthen in the future [1 MS], necessity to ensure relation of URBACT also with different initiatives and programmes such as RFSC, Smart cities and communities, EUKN [Q 7 and 8]. 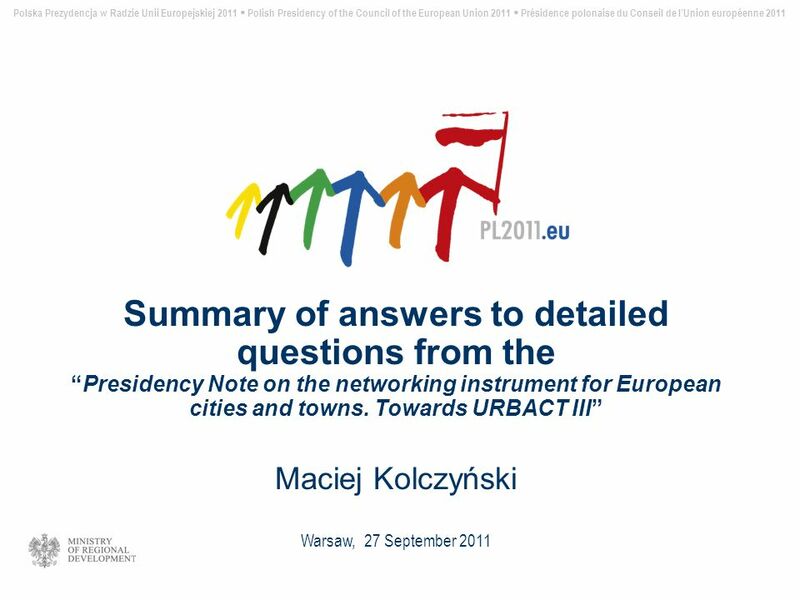 Download ppt "Polska Prezydencja w Radzie Unii Europejskiej 2011 Polish Presidency of the Council of the European Union 2011 Présidence polonaise du Conseil de lUnion." 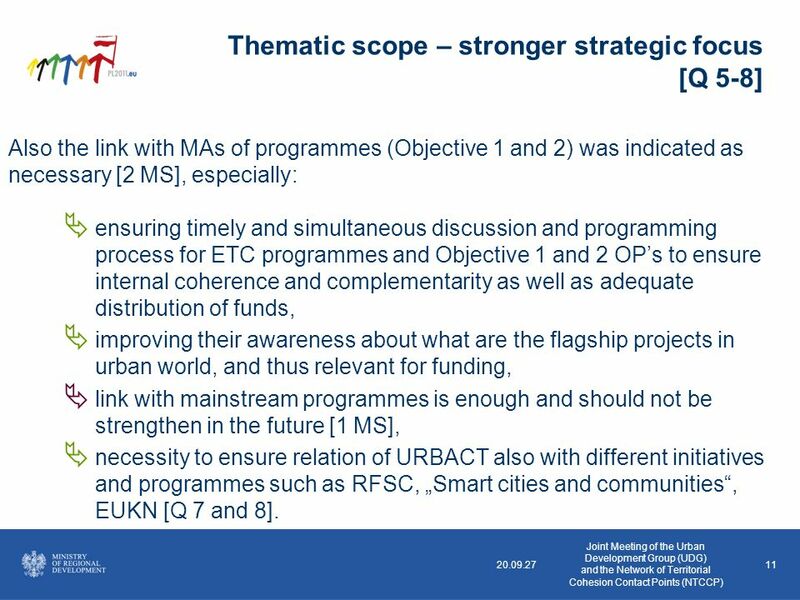 1 The European Platform against Poverty and the role of faith-based organizations in the fight against poverty Dialogue Seminar on Combating Poverty and. 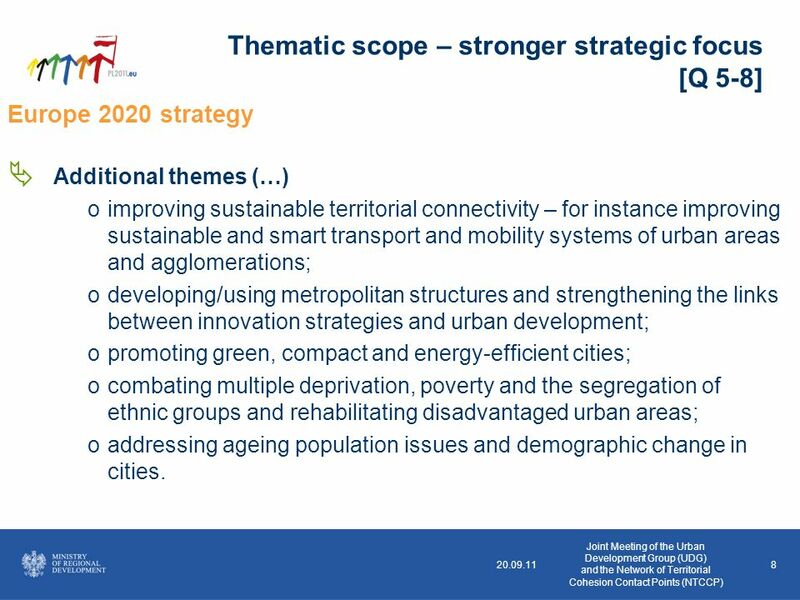 REGIONAL POLICY EUROPEAN COMMISSION The urban dimension : State of play and perspectives Władysław Piskorz DIRECTORATE-GENERAL. 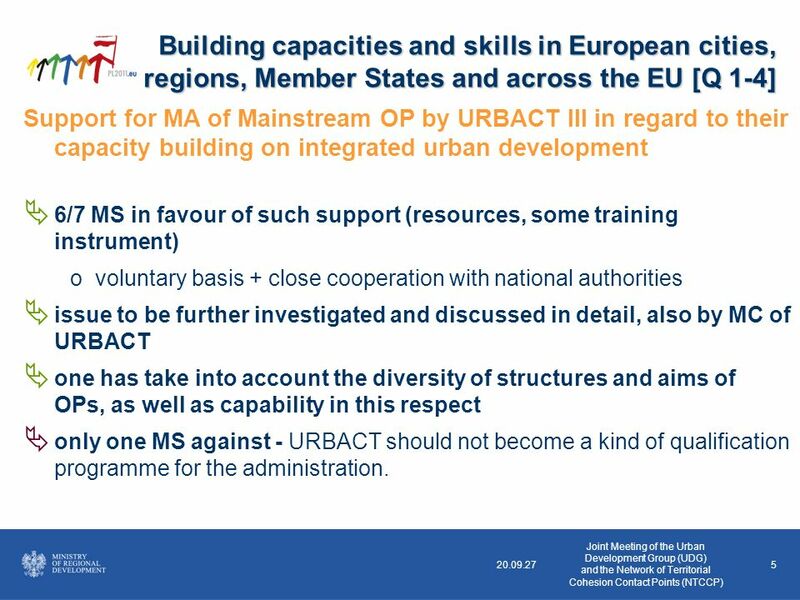 1 Seminar on urban-rural linkages fostering social cohesion in Europe Brussels, 2 July 2009 EUROPEAN COMMISSION DG Employment, Social Affairs and Equal. 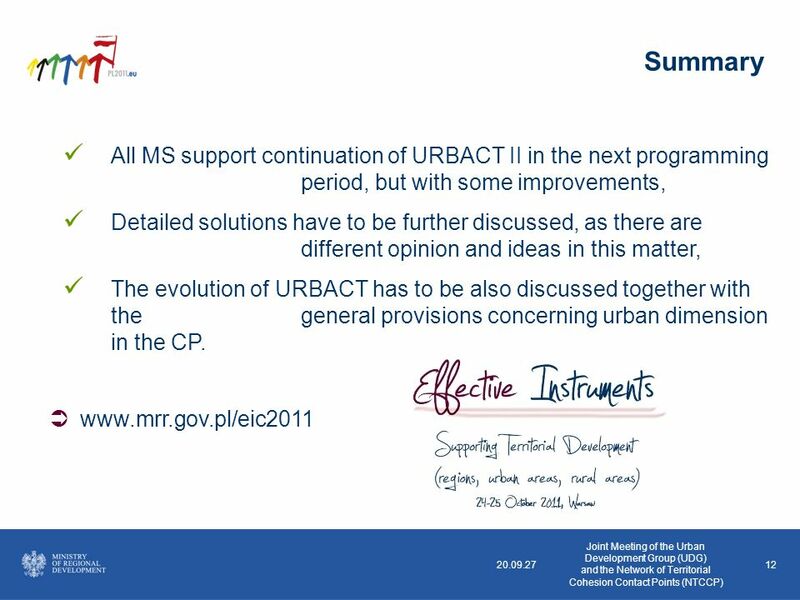 URBACT II Building Healthy Communities 1 st Steering Group Meeting Brussels, 9-10 June 2008 An overview. 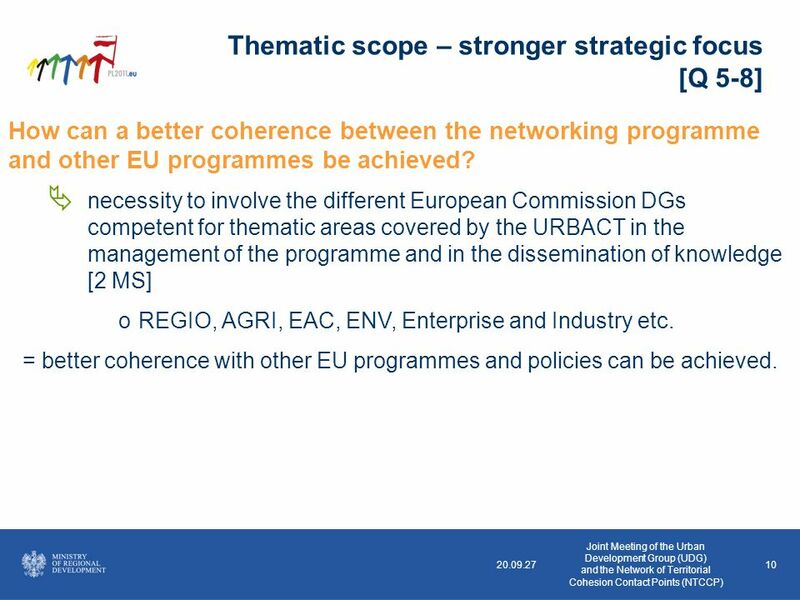 Info Day on New Calls and Partner Café Brussels 18 May 2010 Expectations towards the ESPON Programme from the Spanish Presidency perspective. UK-Brazil urban research network Oxford Workshop 9-11 March 2011 UK-Brazil Urban Research Network. 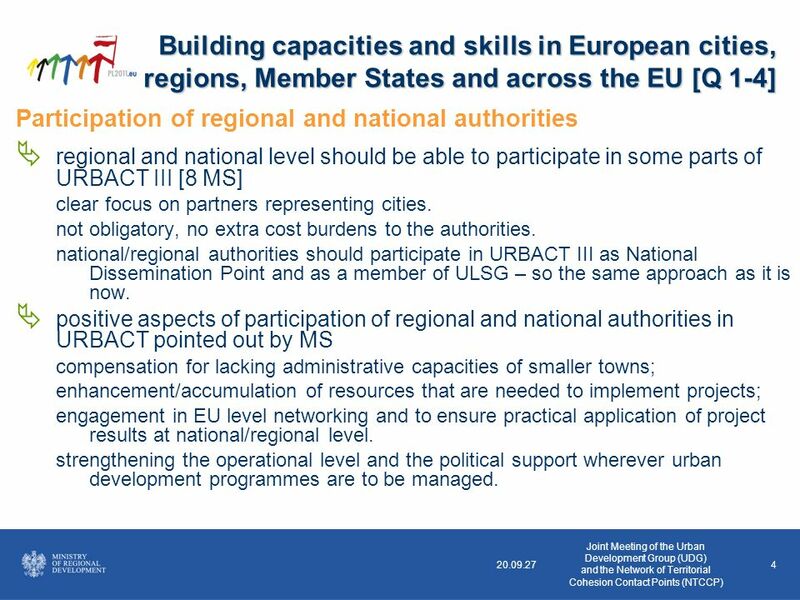 Regional Policy Integrated Territorial Approaches Madrid, 22 February 2013.